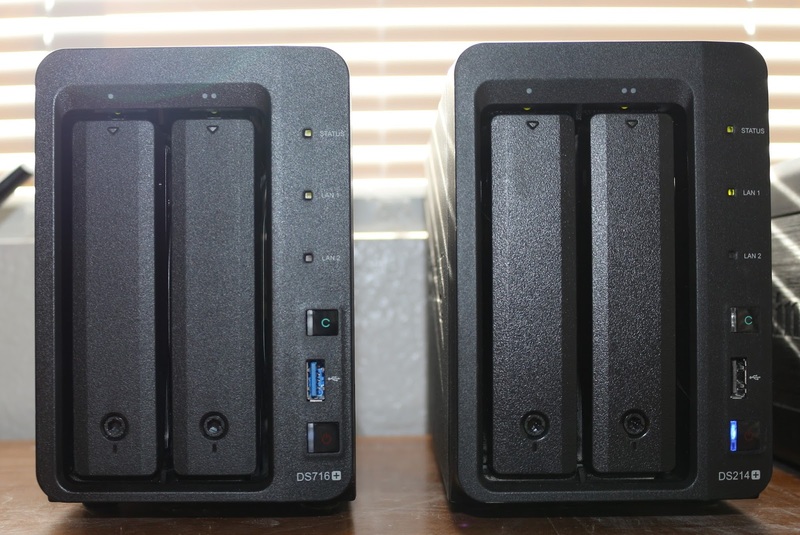 So, we have had a DS716+ in house for a few months now, and unlike other reviews focusing on technical specs and whatnot, we will be reviewing this NAS from a standard consumer point of view and comparing it to the 2014 DS214+. So if you want to see transfer speeds and network overhead info and more.... you won't find it here. If you want to know how your media consumption, or sharing to your phone from another location will work or if it's any better than your old NAS, then read on! Yes, there is a 2 year difference between the 2 devices, and that fine. The average techie tends to upgrade their tech every couple of years, while everyone else will try to make their purchase last as long as possible. I still run a 7 year old D-Link DNS-323 as well as the 2 Synology devices I'm writing about. The primary purpose of external storage is to store your data, and both do that just fine. They both support JBOD, Raid 1 and 0; EXT3, EXT4 and more... EX Fat is also available, as a paid upgrade. NAS devices over the years have come in 2 flavors.... X86 CPUs or ARM based CPUs. Because of this, there is a noticeable price difference. X86 CPU based NAS drives tend to be more expensive, but tend to have a higher feature set as well as being able to use more applications simultaneously. Besides video transcoding, I use Surveillance Station (security cam control) as well as a few others on the DS716+ while the DS214+ is regulated to music and photo streaming. While capable of mostly everything the DS716+ can do, minus transcoding, the ARM based cpu and limited memory definitely hurts it. Wake up and load times are easily 2-3 times longer than the DS716+ and even then, sometimes it can get sluggish. Currently, I have both Synology NAS' setup using "Synology Hybrid Raid." 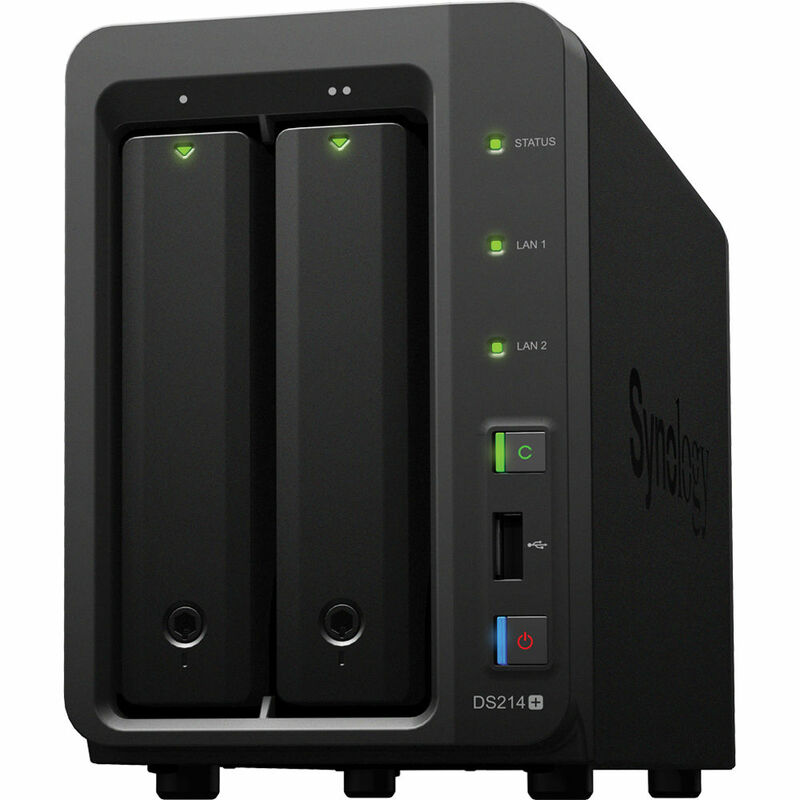 Besides being a Raid 1 setup, SHR allows for easy swapping and expanding of hard drives. So, for example, if 1 drive dies, I can simply swap it out. I could add in a larger drive and SHR will match the other drive's size. So if drive 1 is 2TB and drive 2 is 3TB, only 2TB will be used. After the raid is rebuilt, if I swap drive 1 with a 3TB, it will expand the raid to use all 3 TB automatically after rebuilding it. My DS716+ currently houses videos and files, Surveillance Station for security camera recording, and commonly accessed files. The DS214+ is home to my music and photos. Personally, I'd rather have all files stored on the DS716+ and have an exact copy on the DS214+, but my budget will not allow for it at the moment. Both devices do support up to 8TB drives, so a future upgrade is more than possible. Also, the DS716+ can handle a memory upgrade and I did take advantage of that. For less than $30 US, you can upgrade it to 8GB of ram! The upgrade allows you to not bother with caching to the drives, thus giving you a speed increase for all the applications on it. Time for what I consider the best part, remotely access your files. You have a couple of choices here. 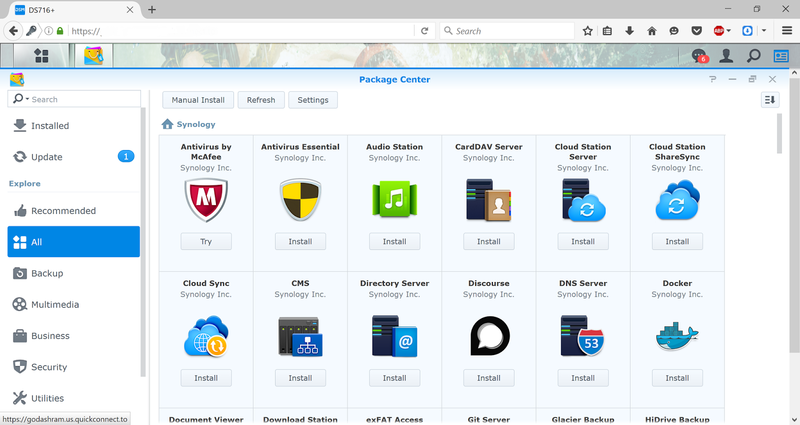 You can either use DDNS, which is ideal or use Synology's Quick Connect service. Setting up DDNS is normally painless, unless you have a double NAT issue like I do currently with my new ISP. Quick Connect, while it does work, will give you a slower connection as you have to tunnel through Synology's servers to get to your NAS. You can also use either an app for Android, IOS, Windows 10 (mobile and desktop) or your browser. Once you have that all sorted out, the fun begins. Using DS Video, Synology's DLNA video application, to connect to my DS716+, I have not run into a single video that won't play. From the oldest MPG or AVI file to MKV, H.264, etc; the DS716+ has transcoded even 4K video to my Windows Phone and browser remotely. DS Music and DS Photo work just as well on the DS214+, since runs on 1GB of ram and has a weaker CPU, it is noticeably slower when browsing within the applications. It's all in the Apps! After seeing some of the specs, you are probably wondering "what else can it do?" The answer is "Quite a lot!" Want to turn your NAS into a router? A surveillance hub? DLNA server? Website host? Email host? Well, you can. 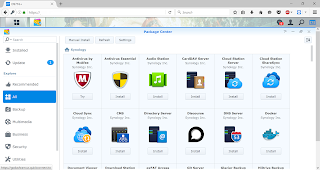 With a single double click on the "Package Manager" icon, you have access to tons of compatible apps for your new NAS. Now your selection and what you can do will vary depending on what CPU your NAS has. For example, for streaming video, ARM based devices, like the DS214+, can only push video at it's native format and if your device doesn't support that format, then it will not play. The DS716+ on the other hand, can transcode said video to fit the specs of the device your are streaming to! There are also tons of other 1st and 3rd party applications available as well and DSM makes it easy. You can either run through "Package Center" or manually install applications. If you are looking to try something specific, a trip to Synology's forums contain a wealth of knowledge and support! If you tend to keep a lot of data like photos and access them across multiple devices, then absolutely you should own a NAS regardless of who makes it. Even if you use it just to back up that data off your PC/Mac. Throughout the years I have had PCs and hard drives fail and have lost tons of data, so having a few other places store my data has been a life saver. If you think a copy on your hard drive, either internal or external, is good enough, then I beg of you, get something to backup your data. Sure, some or many of the features may be unneeded, so a simple NAS, like my aging DNS-323 would do fine, but then you'll be missing out on so many addition features and benefits. Companies like Google, Dropbox, Box, etc may be pushing the world to cloud storage, but what if your internet goes down? What if you hit your free or low price storage limit? I could go on and on. If you also need cloud storage as well, Synology has an app to let you backup your NAS to various cloud services as well, so no worries. So unless you barely ever use a computer or only use it for email and looking up the latest conspiracy theories, chances are you absolutely need a NAS in your life! I have zero complaints about Synology hardware and software and can't recommend them enough.